A trick play — a double pass to the tight end — turns the tide in Washington’s favor. The victory was the Huskies’ first over a ranked opponent on the road since the 2010 Huskies beat No. 18 USC. LOS ANGELES — He lingered on the field, hugging and high-fiving just about everyone he bumped into. Then Travis Feeney cried. This … this was a stunner. 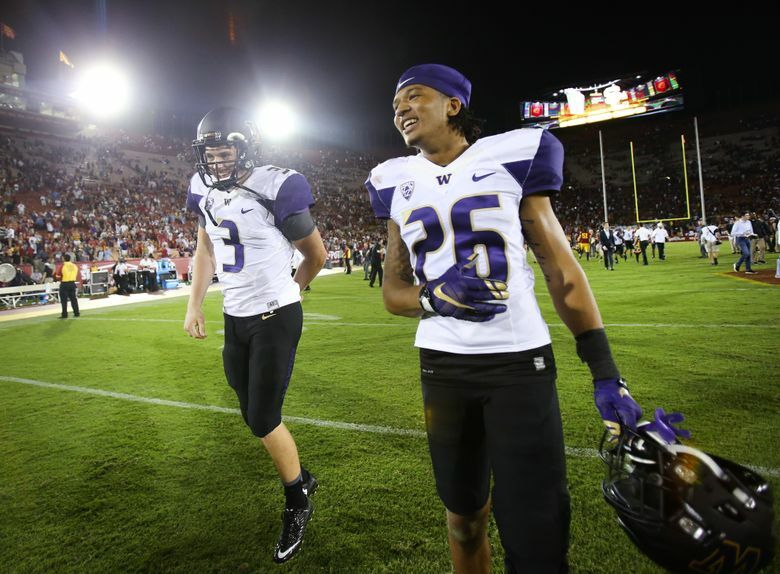 2010 The last time the Huskies beat a ranked team on the road, when UW beat USC, 32-31. 1 Third-down conversion, out of 13 attempts, for USC on Thursday. 156 Passing yards for USC QB Cody Kessler, a season low. Washington, a 17-point underdog, upset No. 17 USC, 17-12, knocking off the Pac-12’s preseason favorites and knocking down former UW coach Steve Sarkisian on Thursday at Los Angeles Memorial Coliseum before a primetime audience on ESPN. Poll: Which position will the Seahawks target with their first draft pick? Afterward, two programs that came into the season at opposite ends of the talent-pool spectrum — USC was supposed to be a national-championship contender; UW was supposed to be in full rebuild mode — exited the field in very different manners. Most of the Trojans beelined for their locker room. They couldn’t get off the field quickly enough. The Huskies went the other way, greeting a pack of Husky fans in the southeast corner of the stadium, soaking up UW’s first road victory over a ranked opponent since beating USC here in 2010. The Huskies (3-2, 1-1 Pac-12) pulled off the upset by shutting down a USC offense that came into the game leading the Pac-12 in points, yards and big plays. They pulled off the upset with a signature Petersen trick play to give them a third-quarter lead they wouldn’t relinquish. 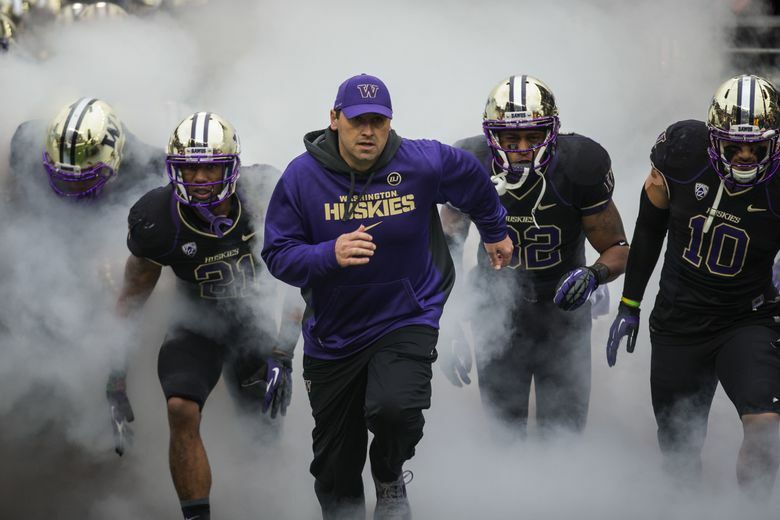 And they pulled off the upset against their former coach, who was familiar with such things, having led the Huskies to seven victories over ranked opponents from 2009-2013. This time, Sarkisian was on the other end. Washington’s defense was dominant from the start. Darren Gardenhire, out of Long Beach, Calif., intercepted Cody Kessler on the game’s first drive. Sidney Jones, another SoCal product, had another interception later in the first half off Kessler, who entered the game with 15 touchdowns, only one interception and considerable Heisman buzz. 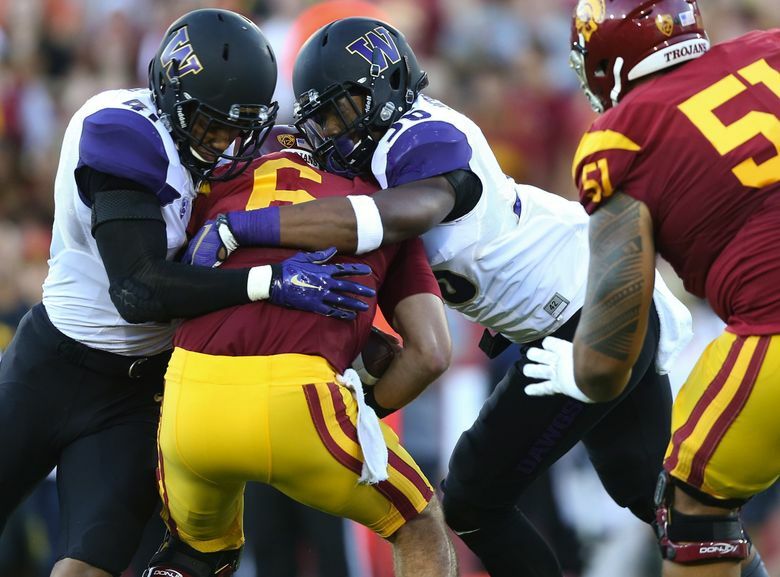 In the third quarter, Jones punched the ball away from USC’s best playmaker, JuJu Smith-Schuster, a fumble recovered by UW’s Taniela Tupou. In the end, the Huskies held USC to one touchdown, 1 of 13 on third downs and limited them to 346 yards — 186 below the Trojans’ average. Kessler was 16 of 29 passing for 156 yards, no touchdowns, those two interceptions and five sacks. 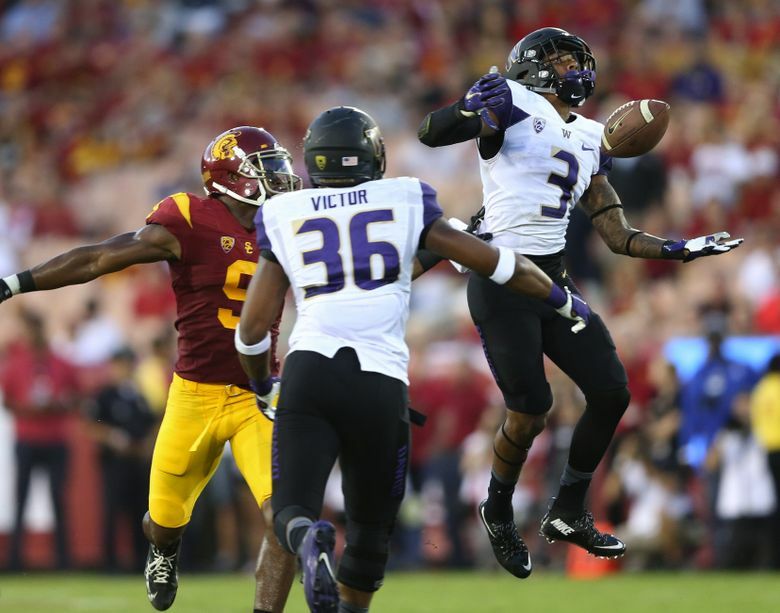 UW’s offense had three possessions start inside USC territory in the first half. Those three drives netted one missed field goal, an interception and one made field goal for UW. A mere three points, as USC took a 6-3 lead into half. 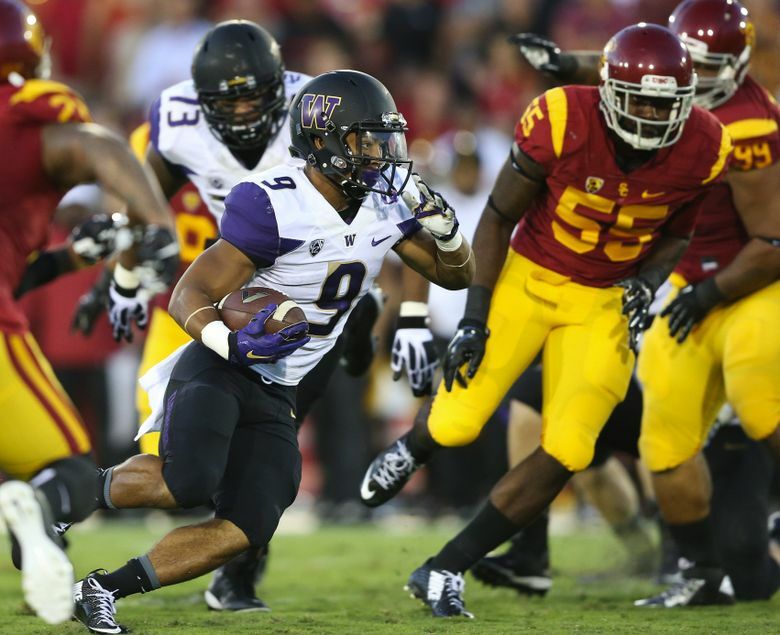 Given another chance in USC territory after Jones’ forced fumble, the Huskies didn’t waste it. Freshman QB Jake Browning started the double pass to senior receiver Marvin Hall, who hit wide-open tight end Josh Perkins in stride for the first touchdown of the game, giving the Huskies a 10-6 lead with 11:24 left in the third quarter. The UW offense added another touchdown on a 1-yard run from freshman running back Myles Gaskin, whose patient, slippery style helped ignite UW’s stagnant run game with 134 yards on 22 carries. His touchdown extended UW’s lead to 17-6 early in the fourth quarter. USC answered with its first touchdown — a 1-yard run by Ronald Jones — to get within 17-12 after a missed 2-point conversion. That drive was aided by a personal-foul targeting penalty on UW sophomore linebacker Azeem Victor, who was flagged for hitting Kessler in the head and ejected. Later in the fourth, Feeney and Elijah Qualls combined on a third-down sack of Kessler, forcing USC to settle for a 46-yard field goal. Alex Wood, the USC kicker out of Mercer Island High School, missed the kick short, hitting the cross bar. That gave Washington the ball back with 3:44 left. Browning completed a third-and-5 pass to Los Angeles native Jaydon Mickens for a 6-yard gain, a first down that enabled the Huskies to get into victory formation. Browning, in his first Pac-12 road game, then kneeled three times, running out the clock and setting off the UW celebration.